Finding galleries that will represent you as an emerging artist requires patience, research and being able to handle rejection. This short eBook explains an effective strategy that dramatically reduces the chances of rejection. One of the most challenging aspects of building a career as an artist, especially in the early stages, can be finding galleries to represent you. 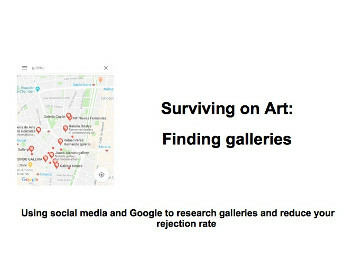 In Surviving on Art - Finding Galleries we explain the approach that we used to research and engage numerous galleries using a focused combination of Google and social media.